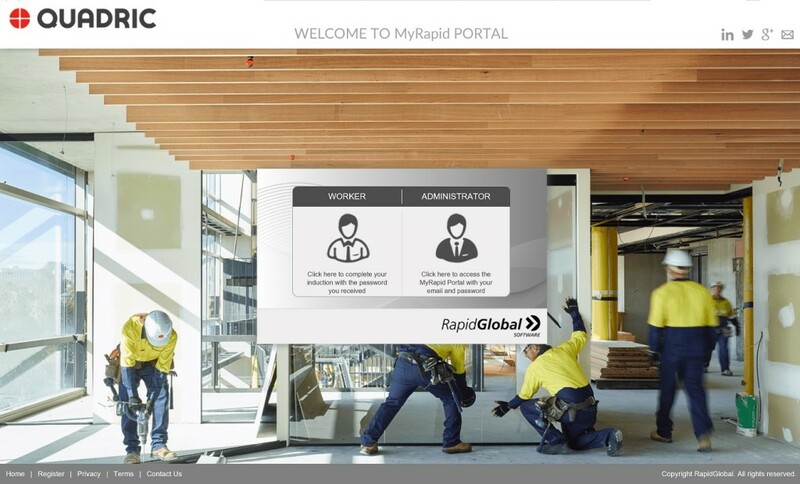 – Rapid Induct, an online induction software system for the creation and delivery of online induction and training courses for employees and contractors. Going beyond most e-learning software and online induction software, with its capability to provide workplace training for in-house staff as well as site personnel. – Rapid Contractor, an online contractor management system, manage the entire lifecycle of contractor compliance from pre-qualification to insurance documentation, induction and on site performance. This provides Quadric an end to end solution for contractor compliance management. – Rapid Incident, an online incident reporting system, which allows personnel to instantly advise, record, and investigate events in the field. Timely information like this can save lives, and Quadric sees the value in this fact. – Rapid Service Alert, an online software system that enables us to schedule regular reminders for repetitive tasks such as equipment maintenance, fire inspections and audits and any other regularly performed task. Any regular planned maintenance or task can be scheduled and tracked in Rapid Service Alert with notifications and alerts delivered to the allocated responsible person. Quadric is justifiably proud of the investment it has made in best practice initiatives of this sort.